Reviews | Does it come with bacon? When I heard a new Korean place was opening up Downtown, needless to say I was very excited since most of my go-to Korean restaurants are a ways north. My best friend (half Korean like myself) Jenn (author of Jenn Dot Com) and I quickly made plans to check Cha:n out! And boy, am I glad we did. I opted to walk from my office in Lower Queen Anne to the restaurant. I arrived early, and I was greeted by Fox the restaurant manager and Nikki the bartender. While waiting for Jenn, I decided to sit at the bar. I struck up a conversation with Nikki going over the cocktail menu, which inventively uses Korean wine and liquor. I ordered a vodka gimlet, my usual drink, and Nikki asked if I liked raspberries and lime. I said yes, so she asked me to trust her. I figured I was in good hands, so I let her work her magic resulting in a vodka gimlet with Bokbunja, Korean raspberry wine. It was beautiful and delicious! 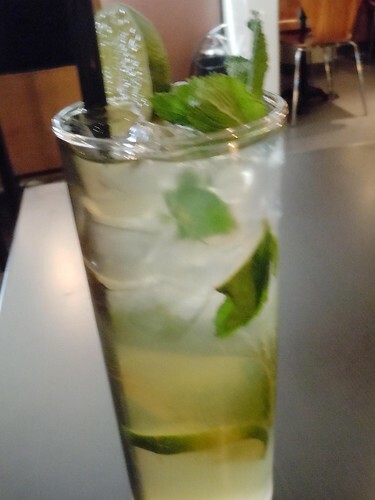 Later on in the meal, I also enjoyed a sojito, a Korean twist on the mojito made with soju, a clear Korean spirit. It’s a perfect summer cocktail. 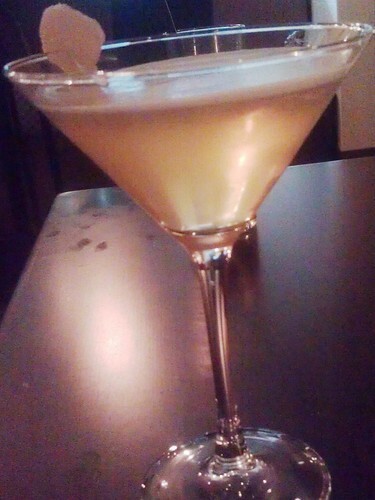 And for a more “dessert” like cocktail, I tried another Nikki creation, the yet to be named brown sugar-ginger-soju martini which used bekseju, another Korean wine flavored with herbs predominantly ginseng. It was bright, refreshing, and just sweet enough. As for what food to order, Jenn and I had a difficult time trying to decide. One thing we did know was that we wanted a good mix of the Traditional and Modern items. To start, we ordered one item from each side of the menu. I really liked that they use mung bean flour for the pancakes, but the kimchi flavor didn’t come through enough for my liking. 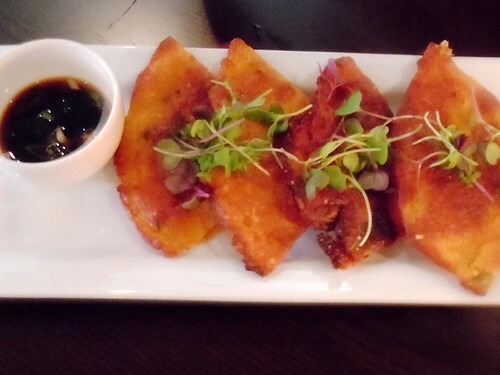 I could see it as a milder “starter” appetizer for someone trying kimchi for the first time, but I personally like kimchi pancakes to have some bite. 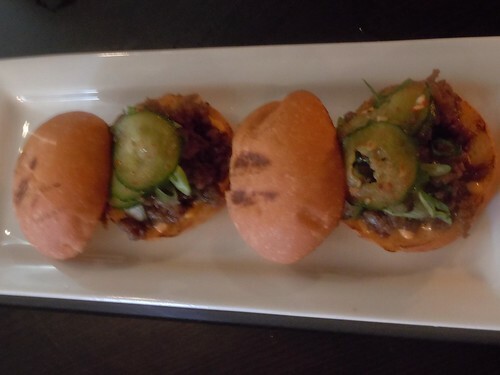 The bulgogi beef sliders, on the other hand, I could have eaten at least five more! The cucumber kimchi added both a freshness and contrast in flavor to the sweet bulgogi marinade as well as provided a crunch. Also, the quality and flavor of the beef was superb. The dish definitely showcased the locally sourced market ingredients and quality meat from Painted Hills. After finishing up those two dishes, we chose two more dishes to complete the meal. Both of these dishes hit the spot. 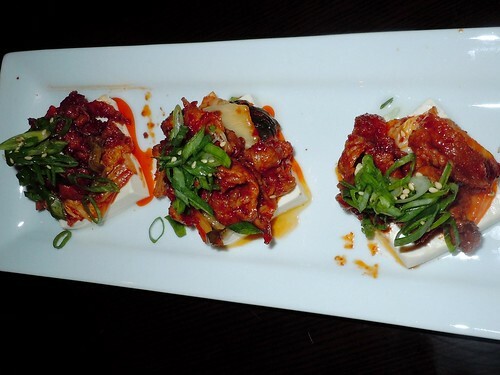 The spicy kimchi pork belly with poached tofu is one of my favorite Korean dishes to begin with, and I was definitely pleased with it at Cha:n. The tofu had a really great texture and flavor. The preparation of the dish with the mound of spicy kimchi pork belly sitting atop the tofu was perfect for getting a bit of everything in each bite! As for the gratin, while on the Modern side of the menu, this dish took me straight back to Korea! 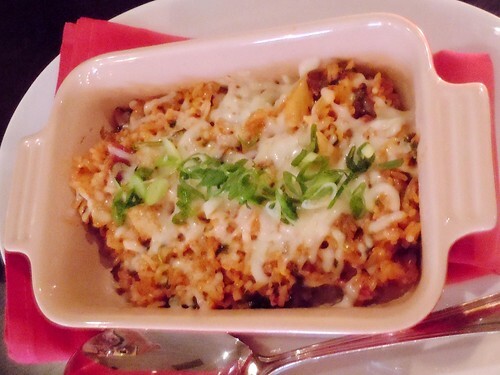 It’s comfort food for sure with a bit of a Western flair. The kimchi really was the star of this dish! I think that even someone who may not think they like kimchi might change their mind after one bite! While we weren’t necessarily going to go for dessert, Fox insisted we couldn’t leave without trying the ginger creme brulee. I am a sucker for creme brulee but I am not always up for ginger flavored things as I can only handle so much ginger. Let me say though that this ginger dessert hit the spot. It had just the right amount of spice and the creme brulee itself was cooked perfectly! It tasted just like these round fortune cookie type treats coated with ginger icing my mom used to buy me when I was growing up, and it was a great way to end a fantastic meal. I will definitely be bringing my fiance to Cha:n in the coming weeks as he loves Korean food as much as I do, but mainly so I can try even more items on the menu! I’d definitely recommend Cha:n if you are looking for a way to introduce people to Korean food beyond BBQ or are looking for a cozy place for a few cocktails and delicious small plates to share. Check Cha:n out on Facebook and Twitter. Disclosure: Does It Come With Bacon was not financially compensated for this blog post but was treated to a complimentary meal at Cha:n. All opinions expressed in this review are mine and based on my experience. So we’ve been to El Gaucho’s Happy Hour three times, but the last two times I decided to take some pictures since I’d been wanting to write about it! The food below is from those two most recent times. Just a little info on the Happy Hour before the visuals. HH is from 5pm-7pm Tues-Fri and 5pm-Close Sunday/Monday. Drink specials are okay with Full Sail IPA ($4), a red and a white wine ($5), and select cocktails ($6). The real deal about their happy hour is half off the bar food menu! The 410 Burger ($9) never disappoints. The past two visits we’ve split the burger, the steamed clams, and the baby back ribs. 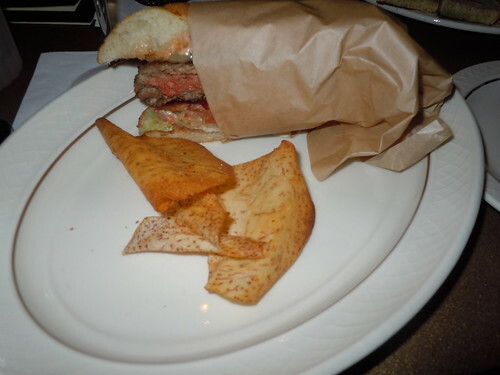 They always cut the burger in half and split up the homemade taro chips, always a bonus in my book! The quality of the beef is outstanding (duh! ), and they cook it perfectly (medium rare by default)! 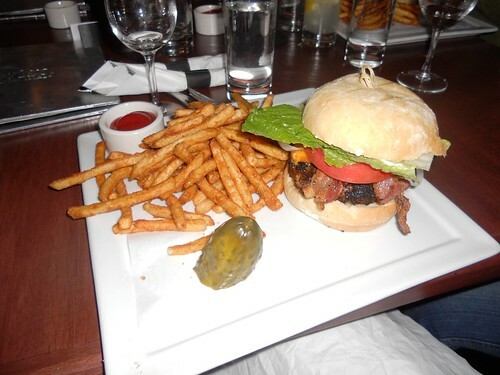 It’s one of the few burgers that I don’t think is better with bacon (Gasp!). The Steamed Clams ($7) were amazing on both visits, so sweet and juicy! The saffron broth is well seasoned and the fennel in it was delicious! And of course you’ve got to love the crostini/bread for sopping up the broth. And let’s not forget the Baby Back Ribs ($8). 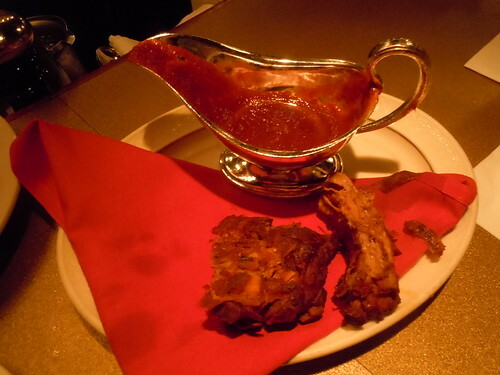 They are fall off the bone tender, and the BBQ sauce is out of this world! I really want to bottle it and take it home with me! This last time the fiancee and I went, my sister met us before we headed over to The Big Picture to watch Horrible Bosses. So this time, we got to a try a few more items (we have a hard time deviating from the burger/ribs/clams combo)! 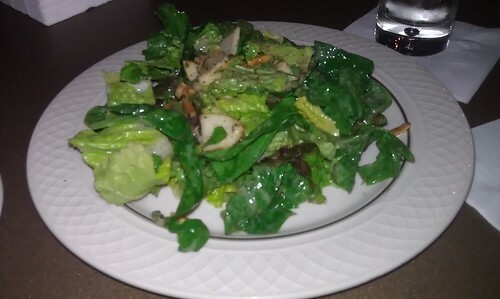 The Mixed Greens ($4.50) were good, but it could have used a bit more acidity. The sweetness of the apples and candied almonds overpowered the dijon vinaigrette. But for the price, it’s not a bad deal if you’re looking for a vegetarian or simply lighter option at the bar. I’d say if you were to go with the Macaroni & Cheese ($6), the Mixed Greens would be a great compliment and a great value ($10 for both). 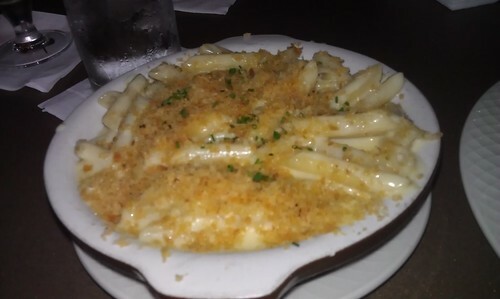 I usually find that even with exceptionally good Mac & Cheese, the pasta used is lackluster. However, with this dish the penne pasta was perfectly al dente and toothsome (in a good way). It stood its own up against the oodles of creamy cheddar (almost a sauce but thicker) and the crunchy panko bread crumbs on top. It’s moved its way into my Top 5 Mac & Cheeses! After eating at El Gaucho, we had about an hour before the movie so we headed across the street to Black Bottle for a drink. My Happy Hour app said they had happy hour going, but that turned out to not be the case. Since we were there, we ordered a round of drinks and some food. 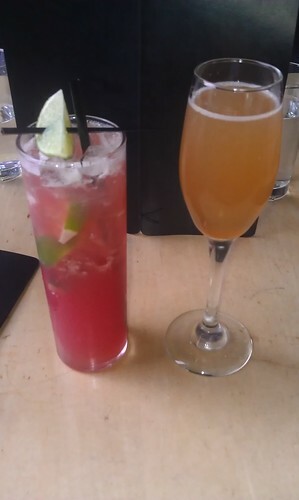 The cocktails my sister and I ordered were excellent, definitely drinks we’d order again! I went with the Rising Sun-rita (sake, blood orange puree, fresh lime), and my sister decided on the Doppelganger (pear vodka, passion fruit rum, OJ, cranberry juice). Both were fairly strong. For food, we tried the Prosciutto and Potato Wheels, not something I’d recommend. It had a balsamic glaze that really didn’t go well with the prosciutto. The rest of the food menu looks good though, so considering how tasty the cocktails were I’d like to give the food another go! In summary, I highly recommend El Gaucho (check ’em out on Facebook and Twitter) if you’re looking for some high quality food at a decent price. For some tasty cocktails, I’d check out Black Bottle as well. Either (or both!) are perfect for when you’re going to catch a movie at The Big Picture! Coming tomorrow or Thursday, Japonessa Happy Hour! And after that, I’ve got at least 2 more updates (Built Burger, Night Kitchen HH, and Dragonfish HH). Then, I’ll be caught up! Last Tuesday, my friends and I gathered for our book club at .twist. Restaurant & Lounge. This was a great venue. I’d been here previously, but this was my first visit after they’d made some changes to the menu and to how everything was set up. I decided it would be a great choice for my blog as the happy hour here is one of the better spots in Belltown with great food deals and good drink options. $3 house red or white and $2.50 Full Sail rotator? Yes, please! Also on happy hour are some great cocktails like the Pearl plum lemonade! 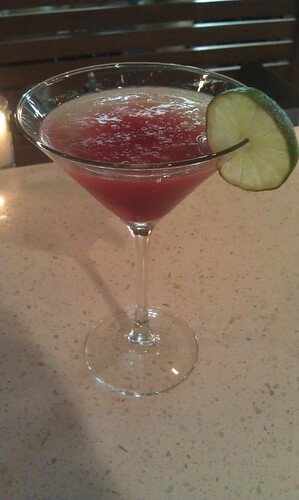 They’ve got a few other Pearl vodka drinks on special as well as a few Belevedere drinks between $4-6! There are also some Don Julio and Hornitos cocktails – something for everyone! We started out with an order of the deviled eggs and truffle fries to share. The truffle fries and deviled eggs were so tasty, we’d almost finished them both off before I’d remembered we needed a picture! The remainders of both are pictured below. 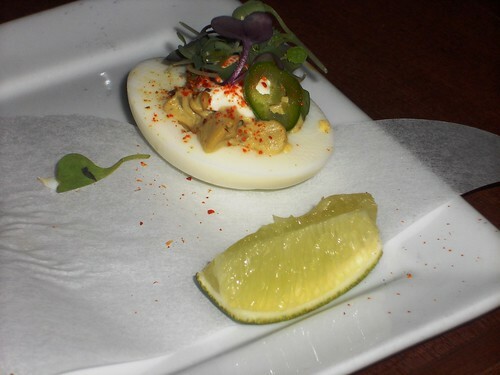 These were the best deviled eggs I’ve ever had! Even if you’re not a big fan of regular deviled eggs, you might enjoy these avocado filled eggs topped with creme fraiche, serrano chillies, and cumin sea salt! I’d had fries from .twist. and Ventana before, which are good. 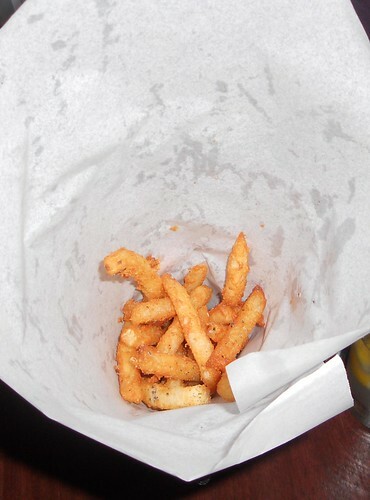 The truffle fries are the same fries but topped with black truffle oil and truffle salt. These were incredible! 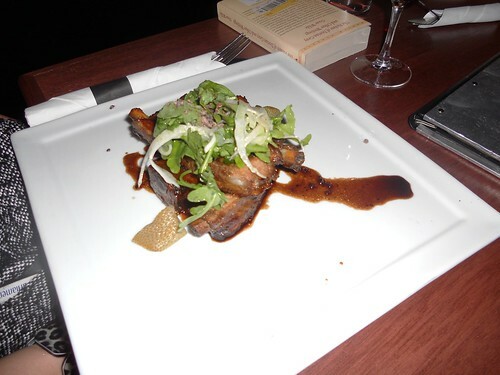 Christine had the balsamic and pepper glazed Carlton Farms pork spare ribs with pickled green strawberries, arugula, and cocoa nibs. This is a dish that’s also on the Ventana menu. The meat just falls right off the bone and melts in your mouth. The glaze is a great combination of sweet and savory. Christine wasn’t crazy about the pickled green strawberries, but I thought they were good. Mike also thought they were a little weird when we’d tried the dish at Ventana. Jenny went with the fried pork tenderloin sandwich. She was quite pleased with her choice! I had a taste of the bacon on the sandwich, and it was mmm, mmm, good with an incredible rich, porky flavor! It was topped with pepper jack cheese and foie gras mustard. 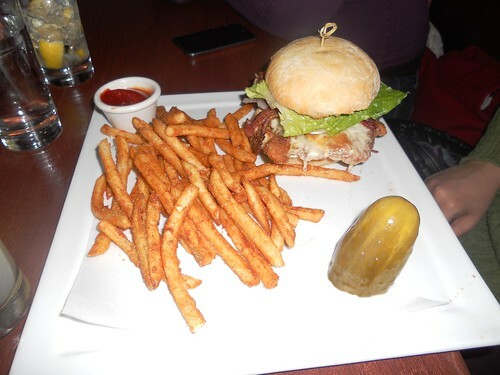 As with most of their sandwiches, it was accompanied with a side of rosemary fries. 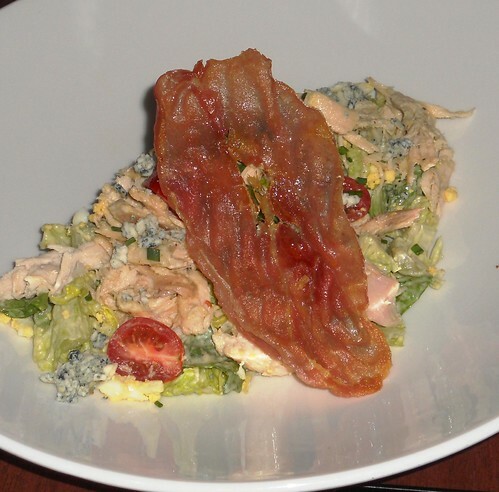 Shannon went with the cobb salad. She said it was good as well. Just look at that crispy fried prosciutto! 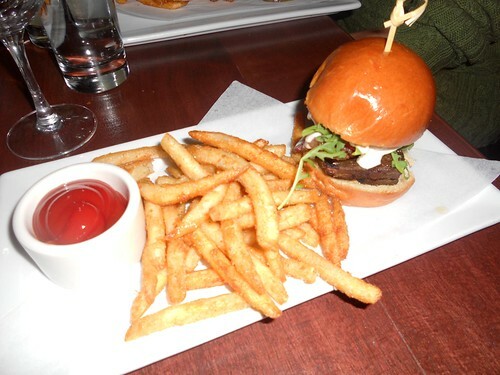 Carmen had the Belltown burger, always a great choice also offered at Ventana. How can you go wrong with a smoked cheddar and bacon burger stuffed with a piquillo pepper and topped with a humboldt fog goat cheese vinaigrette?? The answer is you can’t! 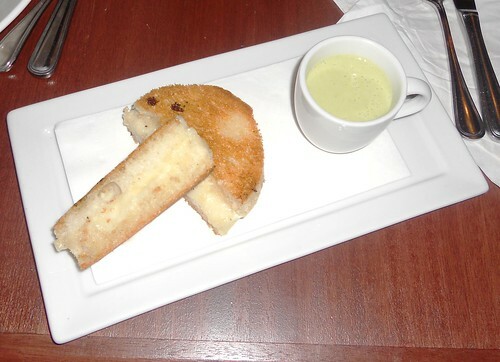 Silvie chose the truffle grilled cheese sandwich with a side of soup. I was really close to ordering this as well! I think I will on my next visit. She really enjoyed it. The soup of the day was cream of asparagus, which Silvie said was quite good! I went with the braised Painted Hills beef short rib slider topped with peppered bacon, arugula, and goat cheese vinaigrette. The flavors of the dish were awesome. However, the short ribs were overdone, so they were dry and burnt tasting on the outside. This totally detracted from the dish; I likely wouldn’t order it again. 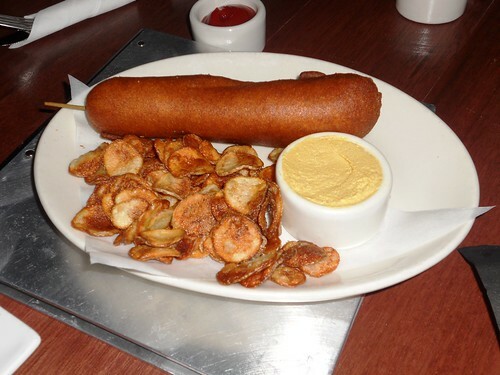 Iris had the duck corn dog, a variation on the ventana haute dog. The first order that came out was cold on the inside. She told the server though, and they took care of things. The re-ordered corn dog was solid. Iris seemed quite satisfied! All in all, a great happy hour spot in Belltown and a good venue for our book club. Next time I go back, I think I’m going to try the Lobster Mac n’ Cheese made with orecchiette pasta, smoked cheddar cheese, and truffle salt or the Steak n’ Egg, which comes with baked fingerling potatoes, a fried quail egg, carrots, and a horseradish demi glace. I saw someone order the Steak n’ Egg at Ventana; it looked fantastic. I love me some quail eggs! Happy hour at .twist. runs Sunday to Thursday 4-12, Friday and Saturday 4-8. You can’t really beat those hours, especially in Belltown! Check .twist. out on Facebook and twitter. Venice, how nice you are! I thought that after all the delicious food in Florence, Venice would have to be pretty fantastic to compete. This city definitely stepped up to the challenge. We arrived in Venice early afternoon, so after we’d gotten settled into our hotel, we ventured out in search of food and drink. I wanted to go to Osteria da Alberta as the description in the Lonely Planet guide sounded good. We stopped at an enoteca along the way, and then proceeded to walk a 2 block radius for 30 minutes or so to no avail. We were about to give up when I saw the Church of Miracles, which I remembered from the map being around the corner from the restaurant we were looking for. As is evident from the pictures below, we made it and it was well worth the 2 hour adventure we had finding it. 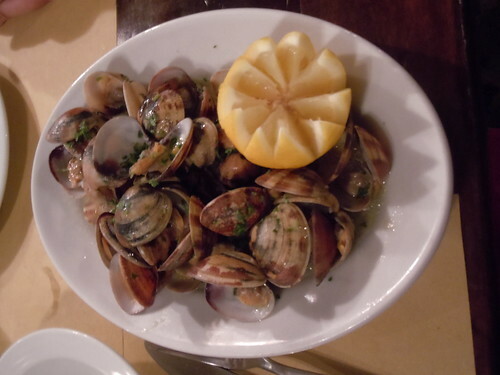 We started with the vongole veraci, steamed clams in olive oil, garlic, and butter. 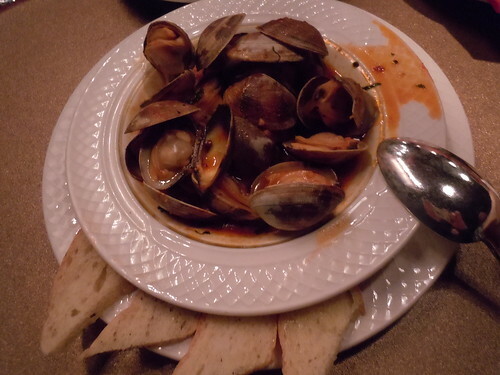 The clams were little, but they were extremely tender and sweet. 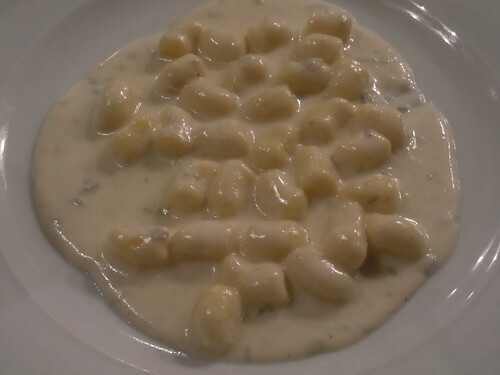 We also ordered the quatro formaggio gnocchi. According to my note written on a piece of paper, BEST EVER!!! Tasty, melt-in-your mouth potato-y pillows. The four cheese sauce was out of this world good. One of the cheeses was gorgonzola which upped the creamy/savory factor. This dish is the stuff that heaven is made of! Mike and I both ate up every last bite of sauce with our bread. And while no picture exists (a testament to its tastiness), we ended this lovely meal with the tiramisu. My notes on the tiramisu: ALSO BEST EVER!! This was only the start to the onslaught of awesome that were our meals in Venice. On our first full day, we went searching for Osteria I Rusteghi. Like almost every restaurant/eatery listed in our guide book, it was an adventure simply locating the place. But once again, worth it. The guide book said this would be the place to make you like lardon; this is an indisputable fact. Mike and I got a small lardo di collonata sandwich, grilled eggplant, and grilled cherry tomatoes to share. Then we each got another sandwich; I went with the copacolla and black truffle, Mike with the copacolla and eggplant. Everything was quite good, particularly the lardon sandwich (creamy texture with a good cured pork flavor) and the copacolla and truffle. Just as in Florence, the use of truffles is amazing and with gusto! Every bite of the sandwich was overflowing with truffle-y flavor! Mmmm! After that, we stopped by SuSo (click here for someone else’s flickr photo) for some gelato, another randomly delicious find! On this first visit, we tried the peanut gelato and another flavor I can’t quite recall; all I know is that they were delicious, particularly the peanut! On our second visit, we had the green apple and the hazelnut; both were awesome. No pictures exist as the gelato was gone before we could even think to take a picture! 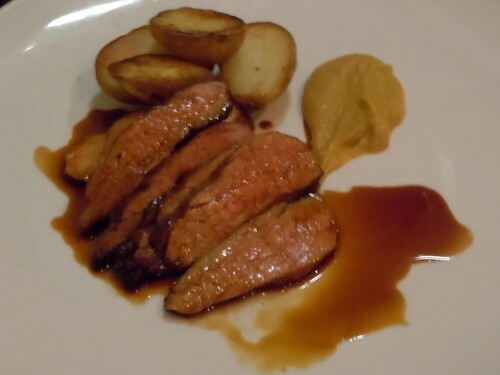 For lunch the following day, we went to Al Merca, an osteria similar to I Rusteghi. For drinks I went with the prosecco (decent, but nowhere near as good as the Collalto Extra Dry!) and Mike had the Valpolicella classico. For food, we shared a polpette di carne (meatball). I also had the parma, robiola, and black truffle sandwich while Mike had the osso collo sandwich. Both were so delicious. Once again, truffle explosions in my mouth complimented by the salty parma cut with the freshness of the robiola. We then shared another meatball and each got one more sandwich! 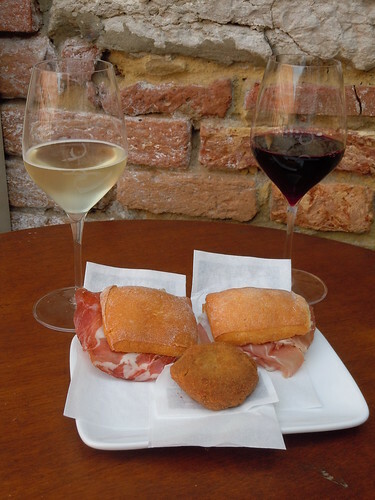 What could beat eating delicious food and drinking wine outside on a beautiful day in Venice? Later that day, Mike took me on a gondola ride. It was pricey but the experience was one of a kind, most importantly Mike proposing! 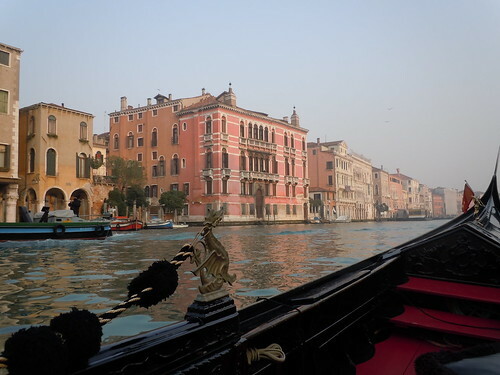 I just had to include some pictures from that; a view from the Grand Canal, just before going under the Rialto bridge, and then a post-gondola ride capuccino photo. To celebrate being engaged, we decided to go out for a fancy-ish dinner. After reading some reviews, we headed for Anice Stellato. It was a nice restaurant known for its seafood. To start, we ordered the small misto di cichetti di pesce. Once again, another dish so tasty we forgot to take a picture until it was gone. Ultra fresh seafood cichetti. From what I recall, it included pickled anchovies which I surprisingly enjoyed. The vinegar really worked with the salty fish. We also had some of the best octopus in vinaigrette I think I’ve ever had. And to Mike’s extreme delight,the misto included fried eel, something that isn’t easily found here in Seattle! 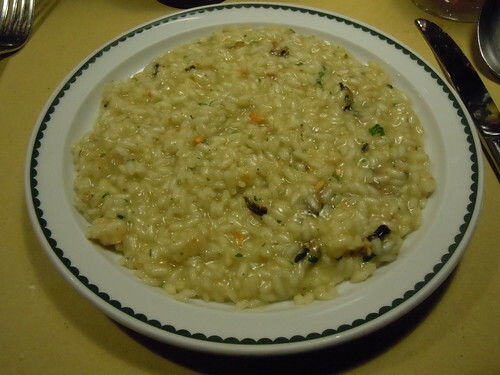 As for things we have photos of, we started with the seafood risotto. In order to ensure you get a bit of seafood in every bite, the mussels, soft shell crab, and langoustines are shelled and chopped up into the risotto – pure genius! All I can say is that the risotto was quite yummy although I don’t have much to compare it to as I’ve only had it once or twice stateside. Then Mike and I shared the pistachio crusted branzino (sea bass). Yum, yum, yum, yum! 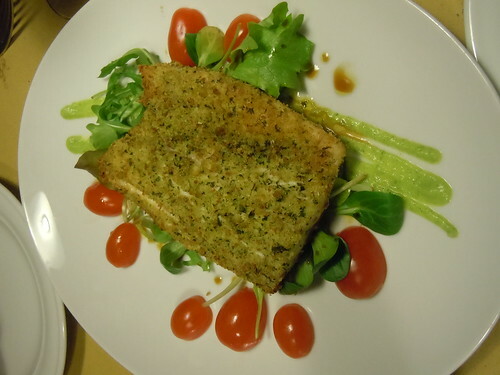 The fish was flaky and light, a great protein dish to follow up the rich risotto. And for dessert, we opted for the panna cotta with mixed berries. Neither Mike nor myself had ever had panna cotta; this was a good first! 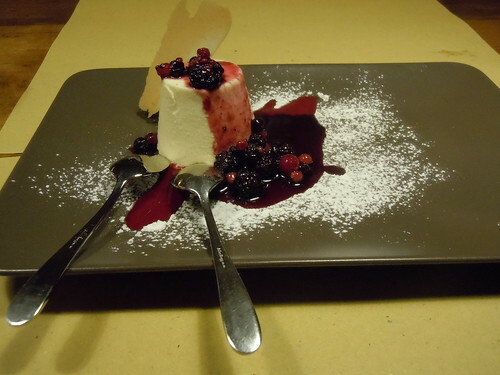 The creamy texture was incredible, and the sweetness in tandem with the tartness of the berries was outstanding. Our last day in Venice we were walking along the main road, and I asked if we could take a look at a menu. A pasta dish with langoustines was on it for a reasonable price (9.50 euro), so I had to get one last taste of langoustines before leaving Italy. Thus, our lucky lunch at Hosteria Al Vecio Bragosso began. We started off with the beef carpaccio; with lemon juice drizzled, each bite of sliced beef with parmagiano reggiano and arugula was a perfect start (no picture again)! 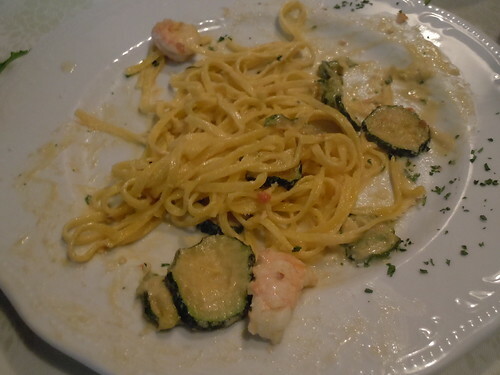 We followed that with the star of the meal, the tagliolini scampi e zucchine. 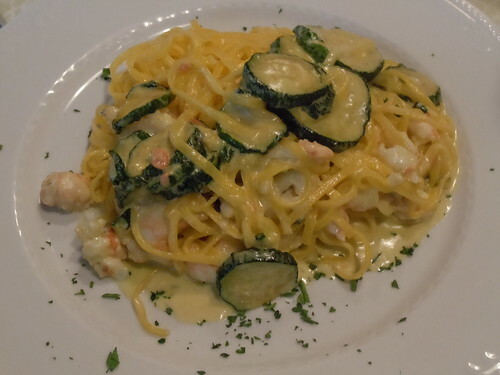 Hand made tagliolini pasta with langoustines and zucchini in a light cream sauce, need I say more? It was so delicious, we only remembered to take a picture once we’d eaten about half of the dish! Check out that succulent langoustine meat! Have no fear though, it was so delicious that as soon as we’d eaten the last bite, we came to the instantaneous decision that we needed another plate! It was *that* good. The langoustines were fresh, tender, and sweet. The zucchini were ridiculously sweet and flavorful. Who knew zucchini was capable of such awesomeness? And that, folks, is our trip as our stomachs experienced it. I hope you enjoyed it as much as I enjoyed recounting it! This upcoming week, back to our regularly scheduled happy hour programming! On our first full day in Florence, we did quite a bit of sightseeing (Santa Maria Novella, the Duomo, the Baptistry, and surrounding area). 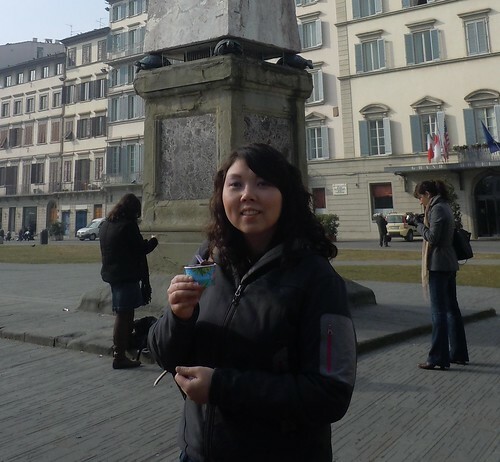 On our way to the Santa Maria Novella, we popped into the Coronas Cafe and tried their gelato. This was a good move on our part. We went with the banana gelato and the mango gelato. The combination of the banana and the mango was like a tropical paradise in my mouth. Our only regret was not making it back here a second time! After all that sightseeing, we were looking for somewhere nice to eat. Looking through my Lonely Planet guide book, I’d found a restaurant that was supposed to serve a great Bistecca alla fiorentina, a signature Florentine dish (basically a melt in your mouth delicious Chianina porterhouse steak). 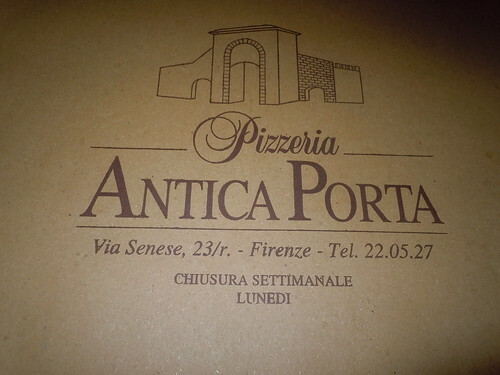 We went to the address indicated in the book (a few blocks from Santa Maria Novella), but we couldn’t find a restaurant matching the name in the book (it escapes me now). We did find another restaurant called Ristorante La Spada in its place that served bistecca alla fiorentina, so we decided to go there. They offered set menus, so we went with one of the “Spada’s Fantasy Menu” and one order of bistecca alla fiorentina. That way, we could try the Florentine steak and get a variety of other things. It was plenty of food! 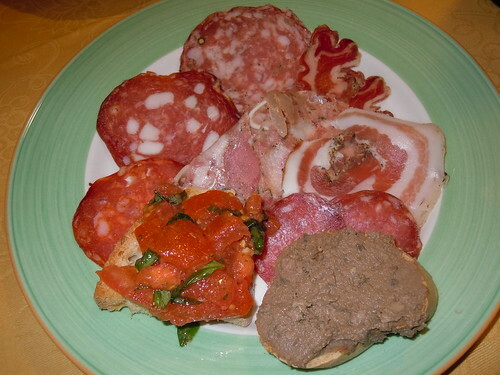 We started with the antipasto misto della casa as the appetizer of the fantasy menu, a wonderful array of different sliced meats, pate, and bruschetta. I was impressed by the sheer variety! 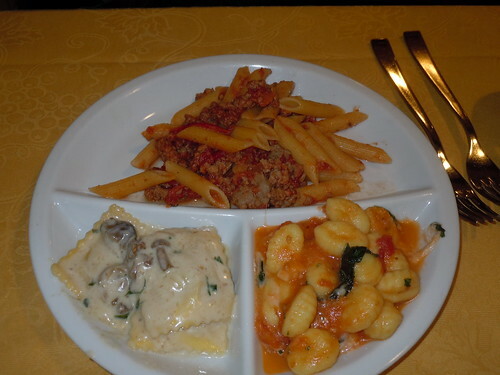 For the pasta course, we were served a trio of pastas: ravioli with truffles and mushrooms, penne with a meat sauce, and gnocchi in a rose sauce. The pasta was good, but not great. It definitely pales compared to the pasta we ate during the remainder of our trip! The steak was so delicious, we forgot about taking a picture until it was almost gone! The roasted potatoes it came with were the perfect accompaniment as well. We drank a bottle of wine with our meal. It was bottled and labeled especially for La Spada with a picture of the restaurant’s outer face on the side of the bottle! For dessert, we had something I can’t recall along with Biscotti di Prato con vinsanto, ‘biscottini’ and sweet wine. It’s apparently only served in the Tuscan region. The wine was really sweet, but it went well with the biscotti. On our third day, we did some more sightseeing. First off, we accomplished our goal of visiting the Uffizi, taking in Tuscan masterpieces including Botticelli’s Birth of Venus. We then walked the wrong way, turned around, and headed back toward the Gallerie dell’ Accademia to see Michelangelo’s David in all his glory. That dude is frickin’ huge! On the way to the Gallerie D’academia, we stopped by the Mercato Nuovo to check out Il Porcellino, the little pig. 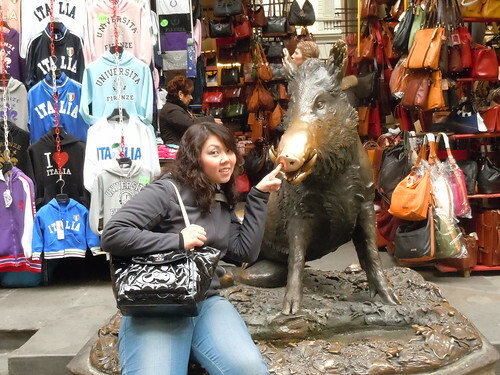 Rubbing his nose ensures you’ll return to Florence, so I had to give it a try! After our visit with David, we made our way across Florence’s city center slowly back toward the hotel. 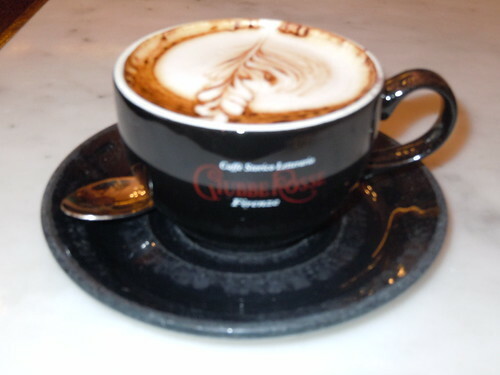 We made a short pit stop at Giubbe Rosse, one of the cafes in the Piazza della Repubblica we’d been to the day before. They had such tasty cappucinos, I couldn’t get enough! They also had cheap, yummy pasta dishes for lunch, which we’d tried out the previous day as well. 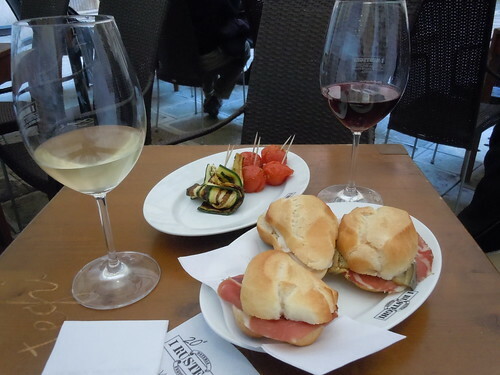 Before heading back to the hotel, we then stopped by Le volpi e l’uva for a few glasses of wine. This was a wonderful enoteca with a great wine selection at a reasonable price. I had the best prosecco (Collalto Extra Dry Prosecco) I’ve ever had for only 3.50 euro a glass. Mike also had a few different delightful red wines. The best part, you can purchase bottles of any wine they serve! I brought home 2 bottles of the prosecco, which was even more special as this prosecco was bottled just for Le volpi e l’uva. Mike brought home a couple bottle of reds as well. I so wish we’d had more room in our suitcase! Since we had so many bottles, we took a cab back to the hotel. And since we hadn’t stopped thinking about our very first meal in Florence, we headed back to Antica Porta. We started out with some bruschetta, which was quite good with lots of garlic. However, we ate that before we remembered to take a picture! Do you see a theme here? 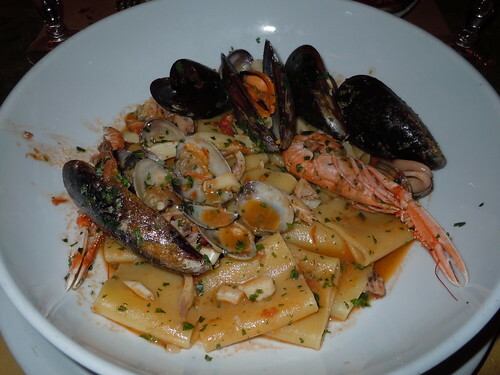 We ordered the pizza again, and then for the main entree we went with the paccheri al profumo di mare con vongole e scampi (paccheri pasta scented with sea clams and langoustines). I knew gamberi was shrimp, so we weren’t sure what scampi referred to. It does not mean a way of preparing a dish like we think in English, but it’s in fact Italian for langoustine. I’d only ever had langoustines once before at Bartolotta at the Wynn in Vegas. It was one of the tastiest sea creatures I’d ever eaten; I was ecstatic to get a taste of them again. I was so excited when they brought out the dish and I saw the lobster-shrimp creatures in the dish along with mussels, clams, octopus, and squid. The dish was incredible. We used up all the bread at our table to soak up all the sauce. I could have eaten a whole other portion of this! 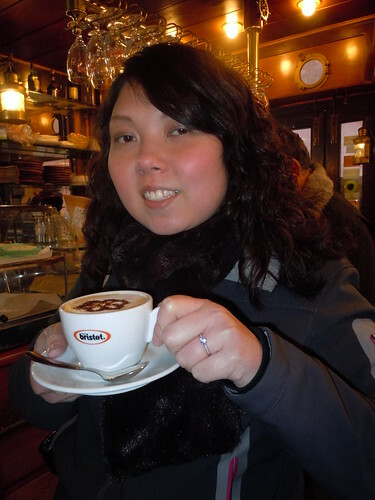 Tomorrow, I’ll recount our culinary adventures in Venice. It only gets better from here! After a night in London, we caught our plane from Gatwick Airport to Venice, Italy. From Venice, we hopped on a train to Florence. That Sunday evening, it didn’t seem like there were many places open. Instead of wandering aimlessly, we asked the concierge of our hotel (Hotel Villa Carlotta) what restaurants nearby were open. 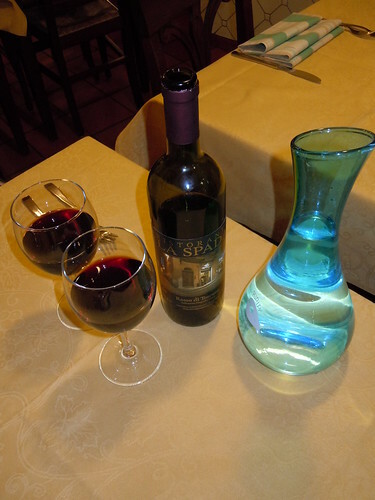 He recommended Antica Porta, so we headed down the hill from the hotel toward the restaurant. When we arrived at the restaurant, there were 4 servers/waitresses in their late teens/early 20s. Three of them were a bit hesitant to take us to our table, urging the fourth girl to assist us. From what we could surmise, the other girls urged our server to help us as she knew the most English. She brought us a menu in both English and Italian. Sometimes I think this is a bad sign when in a foreign country, but in this case it wasn’t at all. 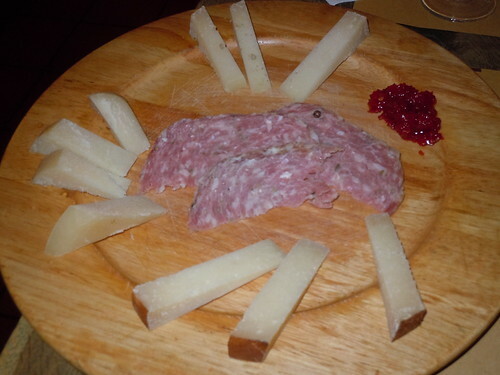 We were starving, so we started off with the pecorino and salami platter. The quantity was a bit more than we expected, but we weren’t going to let any of it go to waste! The platter came with a delicious roasted red pepper tapenade that was just the perfect blend of smoky and sweet flavors. Together with a piece of pecorino and salami on a bit of Italian bread, it was a lovely start to our meal. I don’t think I’d ever had pecorino with such a sharp, rich flavor before! We followed that up with the Fonduta di tartufo nero e porcini pizza, black truffle and porcini mushroom pizza Tuscan style. It had a very thin crust, so it was a bit difficult to eat. That didn’t stop us from enjoying every last bite. There were decent size pieces of shaved black truffle and nice big pieces of porcini mushrooms. There was also some truffle oil drizzled all over for a little extra flavor. This was probably the best pizza I’ve ever eaten. It was so tasty, we almost forgot to take a picture! After the pizza, we were worried if anything else would live up to that! Luckily, the spinach and ricotta gnudi with buffalo mozzarella in a ragu sauce did not disappoint. 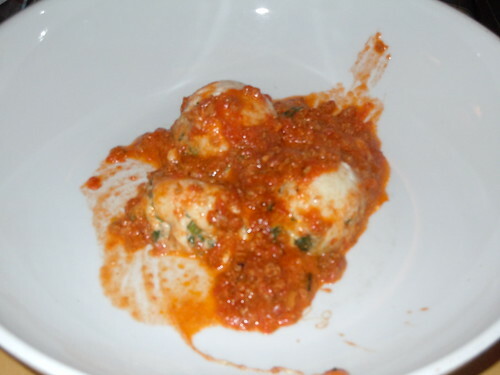 The gnudi were rich, savory pillows with a veil of buffalo mozzarella covering each gnudi. The ragu added a tartness and meatiness that made each bite even tastier. Had we not started out with the salami platter, I guarantee you Mike and I would’ve ordered another order of the gnudi! After all that, we still had a tiny bit of room for something sweet. Not wanting anything too heavy, we decided upon the vanilla gelato with pine nuts and chocolate sauce. The gelato had such good vanilla flavor and the dark chocolate sauce added to each bite. 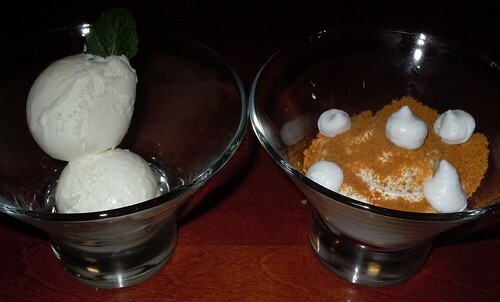 The pine nuts throughout the vanilla gelato added another layer of flavor. 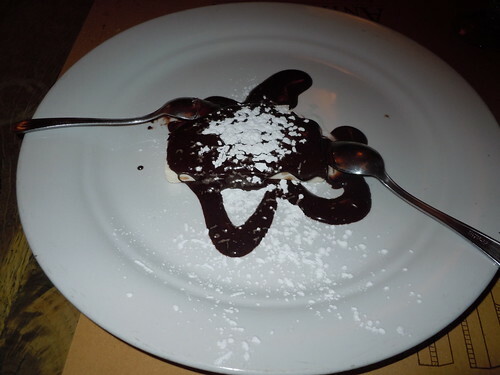 It was like a deconstructed klondike bar with an Italian twist! After such a delightful meal, we hiked back up the hill to the Hotel Villa Carlotta and fell fast asleep. Just a quick note, I would recommend the Hotel Villa Carlotta to anyone visiting Florence. It’s about a 15-20 minute walk from the Duomo, but it’s so lovely and affordable. We reserved the hotel for 3 nights through Hotwire, for $65 a night! It had a nice bathroom with a shower and a decent bed. The staff was very helpful and nice. Also, the hotel has a free breakfast each morning with quite the spread including various bread, rolls, croissants, pastries along with a selection of salami, ham, prosciutto. They also had breakfast cereals, granola, and boiled eggs. The breakfast service also included tea, juice, coffee, and capuccinos/espresso. More Florence Food Finds on Tuesday! So after a bit of a hiatus, I’m back! But before catching up on my un-Happy Hour at Lecosho with my best friend Jenn of Amateur Gourmand, I’ve got to post about Mike and my recent trip to Florence and Venice, including a night in London. Since we’d have been too rushed trying to jet from Heathrow to Gatwick for a flight to Venice on the day we arrived from Seattle, we decided to stay the night in London. We had a few evening hours to kill, so we walked around near Buckingham Palace, Westminster Abbey, and Big Ben. But before heading off to do that, we needed some food to sustain us. After some walking around, we came across Bumbles Restaurant. They had a 3-course set price menu, so we decided it would suit our budget. 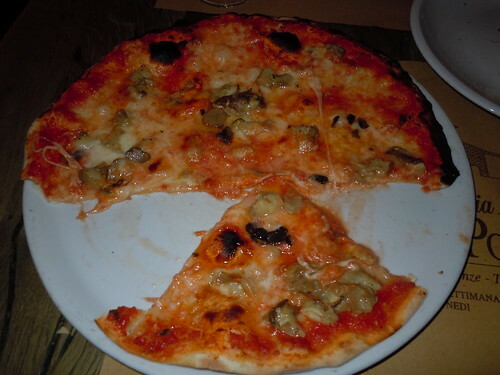 While compared to the food we ate in Italy it wasn’t earth shattering, it was a good meal worth writing about. 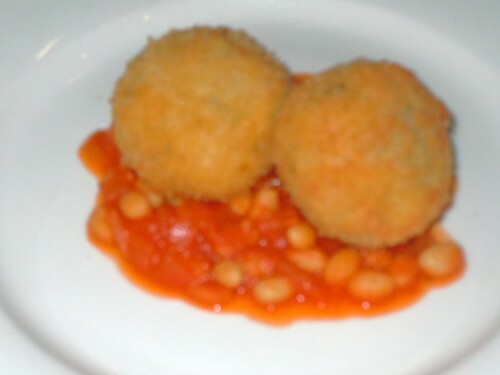 Mike started off with the fish cakes and baked beans, while I went with the onion soup. Mike quite enjoyed the fish cakes and baked beans. I just thought it was okay, but that was more due to the texture than the flavors. I will admit the cakes tasted good in combination with the beans. 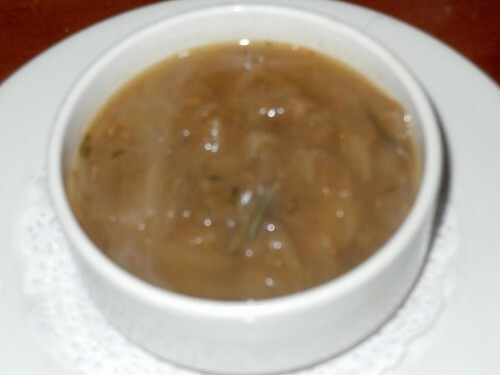 The onion soup (as you can see) was just a simple onion soup, like french onion without the fanfare. It was good, but not great. Then, came the entrees. Mike went with the roast pork with spiced aubergine (eggplant) and new potatoes. The pork was so succulent with a great flavor. The eggplant puree was spiced with curry, which really worked well with the pork! The new potatoes were delicious as well. I had ordered the Devonshire lamb bolognese. 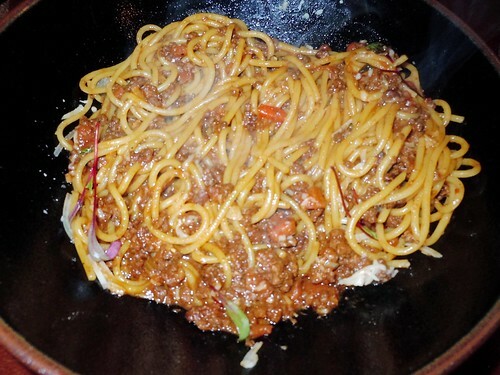 While it was unlike any Italian bolognese I’d ever had, it was an interesting English take on a pasta dish. The lamb’s flavor really shined through even though it was ground; there was a healthy portion of lamb throughout the sauce, which was very hearty and comforting. And while I am not crazy about spaghetti noodles, I enjoyed them in this dish. For dessert, Mike went with the vanilla ice cream while I decided on the yoghurt mousse. While the vanilla ice cream was just fine, I couldn’t get enough of the yoghurt mousse! 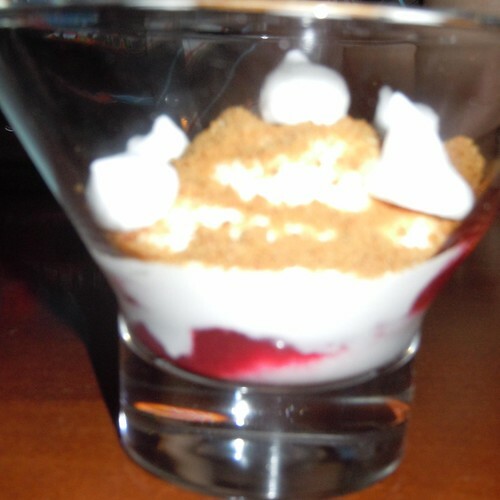 Imagine the flavor of Red Mango yogurt with the texture of a light mousse combined with some berry coulis, crushed gingerbread cookies, and meringue. It was so refreshing and a perfect end to the meal. And since we were in a magical land where they exist, Mike and I had to make sure to get a Zinger Tower Burger while we were in the UK. This fabled burger first came into our lives while living in South Korea, a treat I’d only indulge in when going on vacation flying out of Incheon Airport. 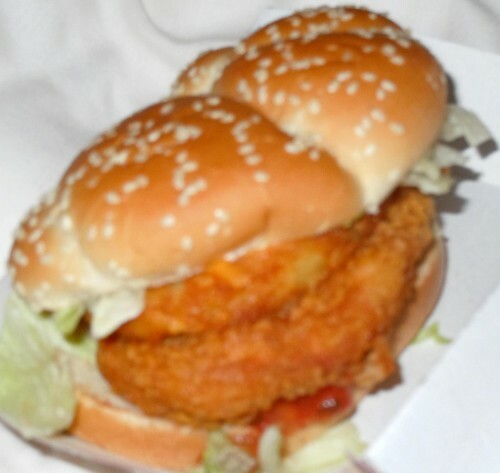 Imagine a spicy Zinger burger fillet with a hash brown and American cheese on top – need I say more? The UK variety (pictured below) adds salsa into the mix, which honestly really isn’t necessary. While it wasn’t as great as its Korean counterpart, it was still yummy (and something unattainable in the good ol’ U S of A). I’ll be working tonight to format and upload all my pictures from Florence and Venice, so look out for those posts later this week!